The days of Ferris Bueller-style truancy are numbered. From college lecture halls to corporate training centers, the acceleration of AV capabilities means every student can see the professor perfectly, even if they’re at home with the flu, on another continent, or at a made-up relative’s funeral. Audio-Technica’s System 10 PRO Rack-Mount Digital Wireless Systems provides operation in the 2.4GHz range. 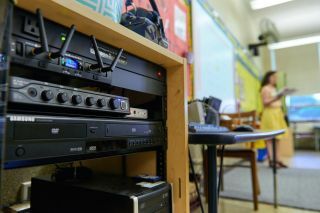 In addition to aiding speech intelligibility, quality classroom audio reinforces media playback and emergency messages. Besides paying off in real time, audio best practices pay off long after the fact when lectures are recorded for future use as online learning tools. “Nowadays, classroom materials are being recorded and then shared online, enabling students to reference the content after the event,” said Phil Stanley, regional sales manager, Northern Europe for Revolabs. “However, capturing video and lecture content without audio can render the recording useless. That’s why lecture-capture recording—bringing recorded sound together with lecture content and video into one cohesive piece—is one of the biggest areas of growth we see for audio in the classroom. Revolabs HD Single/Dual Channel Microphone System features a compact design to reduce the real estate required for audio equipment on tables. There are many signal path points that AV integrators must consider for optimizing audio, but the microphone is the first line of defense. “What you lose in the beginning cannot be compensated for by algorithms later,” Niemann said. “A quality microphone optimized for highest speech intelligibility, such as the Sennheiser SL Headmic 1, will provide consistently clear input. Moreover, a great audio experience is not only determined by the quality of the capture but also by the usability of devices. Integrators need to bear in mind that the best microphone does not help at all if people are not willing to use it. User-friendliness and product appeal are key in this respect. With SpeechLine Digital Wireless we offer a solution that has been fine-tuned to speech applications, with dedicated capsules and audio algorithms for optimum speech capture. In addition, this wireless microphone system is as easy to use as a clicker for presentations. If delivery of audio anywhere is the goal, clear communication between integrator and institution becomes key. “How the audio and video get delivered across the world comes down to the videoconferencing platform, as well as the networks and audio distribution being used in the building or throughout the campus,” Stanley said. David Weiss (dwords.com) writes extensively about AV, audio, and broadcast technology.